There are restaurants that seem woven into the very fabric of Hong Kong: the open-air dai pai dong to the new wave of cha chaan teng, the gastropub proudly championing local breweries, and even the trendy wine bar which spills out on the streets of SoHo. Then there are those that seem to be airlifted in — places like Estiatorio Keia, which on the surface have few tangible ties to their locale. Here, the seafood is freshly caught off the coast of the Mediterranean, the consulting chef Alexis Zopas is hot off his post at the hip Scorpios Mykonos, and the wine list comfortably treads the Euro-centric regions of France, Switzerland and Italy. Places like this seem to exist in a sphere all their own, providing a playground for Hong Kong’s nobility (read: wealthy execs) to discuss matters in private over glasses of white Burgundy. And in fact, if you fall in the aforementioned one percent, it’d be easy to gloss pass a messier thread in the story: that of Seafood Room and its operators Bulldozer Group. The surprisingly resilient Russian F&B group led by restaurant mogul Alexander Orlov abruptly declared bankruptcy back in 2017, packed up their Causeway Bay kitchen and left town, leaving nothing but a mountain of unpaid bills and an empty blue-green glass shell of extravagant taste (one graced by the likes of Adrien Brody on its opening night) in their wake. Industry insiders are still reckoning with the fallout of Bulldozer’s first failed attempt, but to the larger market, its reputation is yet untarnished, and ultimately, perhaps, irrelevant. After all, won’t Centralites always welcome another place to raid their expense accounts on a Tuesday night? Working within the framework of a defined style of cuisine, a central location and better-trained staff (all factors that their strange and ambiguous seafood emporium lacked), Keia certainly has more of an infrastructure to make a bid for permanence this time. But are they poised to repeat the same blunders which led to the untimely demise of Seafood Room? We stepped in on a pair of recent evenings to peek past the shiny veneer and find out. 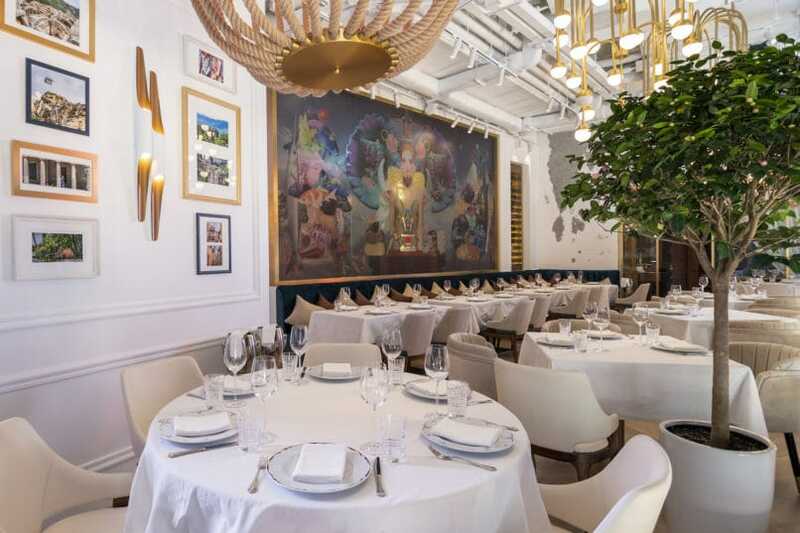 Keia is, of course, not the first but the second restaurant to open with Bulldozer Group’s return, as it aims to reinhabit its highbrow corner of the Hong Kong dining sphere from within the glitzy art edifice of H Queen’s. On the third floor, Ichu Peru, which opened last September to generally positive reviews, rides on the credentials of one of the world’s most respected proponents of South American cuisine, the Peruvian chef Virgilio Martinez. Located one floor down, Keia is just as extravagantly outfitted as Ichu, but while the former is shrouded in scenes of the Amazonian jungle, Keia nails the balance of contemporary luxury and marine décor accents. Estiatorio Keia embraces a maritime theme with heavy-roped chandeliers, ocean-inspired artwork and sea-blue banquettes. We’d expect nothing less from the Bulldozer Group, who are known for bringing posh concepts such as Italy’s Cipriani and London’s Novikov to the UAE. 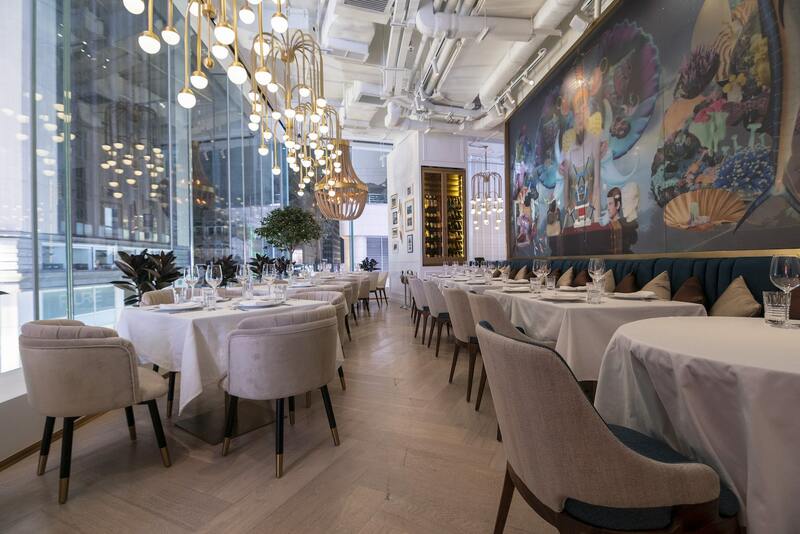 In Hong Kong, their outlets embrace the same sense of splendour: At Keia, the maritime theme is reflected in the ocean-blue, expensively upholstered banquettes and armchairs; the scenes of sea life in colourful murals and mosaics inspired by Greek fables, and the brassy lighting choices which oscillate between giant roped nets and elegant chrome chandeliers with curved arms dangling down from the ceiling, like giant octopus tentacles. Contrasting textures, materials and colour patterns are applied to brilliant effect, achieving a blend of modern elegance without feeling entirely unapproachable. The overall effect is stunning, with the dining room encased in floor-to-ceiling glass windows. One side of the entryway is flanked by the large open kitchen, fronted by a seafood display where spiny lobsters try to plot their escapes throughout the evening, crawling over the display case and onto the floor, only to be scooped up unceremoniously by the wait staff and plopped back upon their icy bed on death row. 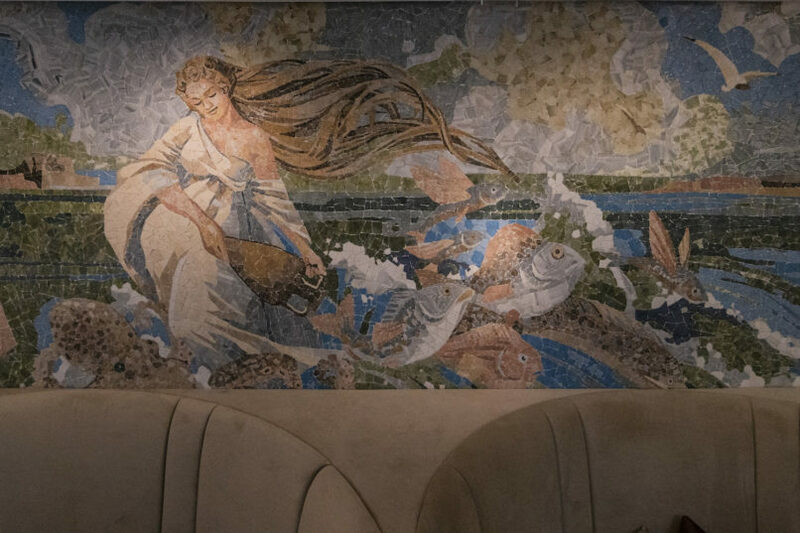 Large-scale mosaics spell out scenes of ocean life and old Greek tales. Seafood Room’s biggest downfall was its irrational pricing scheme: Apart from a few side dishes, nothing cost under HK$200 on the menu. At Keia, prices have been recalibrated to fall more in line with the average cost of dinner in Central — the first good sign as we peruse the two-page menu. The other is a sense of cohesiveness that was never present in the group’s first foray, which was an odd mesh of sashimi, Italian hot dishes and Cantonese-style stir-fry. Under the umbrella of Greek cuisine, the menu — created here by the Mykonos-based Zopas and Executive Chef Drew Andrade — is oriented around familiar categories: fresh and vibrant salads, pita bread and dips, Greek pies or peinerli, and a selection of fresh Mediterranean fish and seafood. 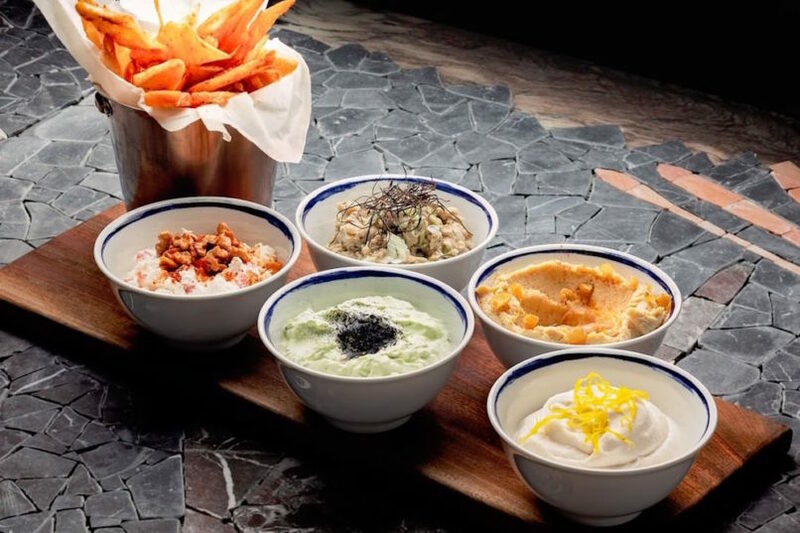 An array of Greek dips and pita chips. A third sign that the group is upping their service standards is the gesture of generosity to kick off the meal: We’re welcomed with a plate of hummus with pita chips and soft, homemade bread buns to snack on as we make our selections. The “Raw” section is the natural starting point; from here, we opt for the salmon tartare (HK$158) and the Greek ceviche (HK$188). The salmon is fresh and the flavours punchy in the former, though overwhelmed by large chunks of onion; while the latter is let down by the sea bass, which falls prey to a mushy texture despite a vibrant dressing of lime and citrus. We’re a fan of the Mykonian Style Salad (HK$148), which isn’t really a salad at all in the traditional sense: A scattering of boulder-like wheat croutons replace greens as the base, providing a crunchy counterpoint to the soft chunks of goat cheese, drizzle of fruity olive oil and vivid red tomatoes plucked off the vine at the peak of ripeness. Saganaki (fried cheese) is always a crowd favourite, and Keia’s version (HK$138) includes a trip to the deep fryer — think a Mediterranean spin on mozzarella sticks — with golden triangles of battered Graviera cheese stacked around half-moons of ouzu-sautéed pears. To round out the starters, a mezze of taramasalata (HK$48) is garlicky and shot through with the saline tang of smoked roe, mopped up with an ethereally light pita pocket which gets puffed up in the central oven before being deflated at the table like a pricked balloon. 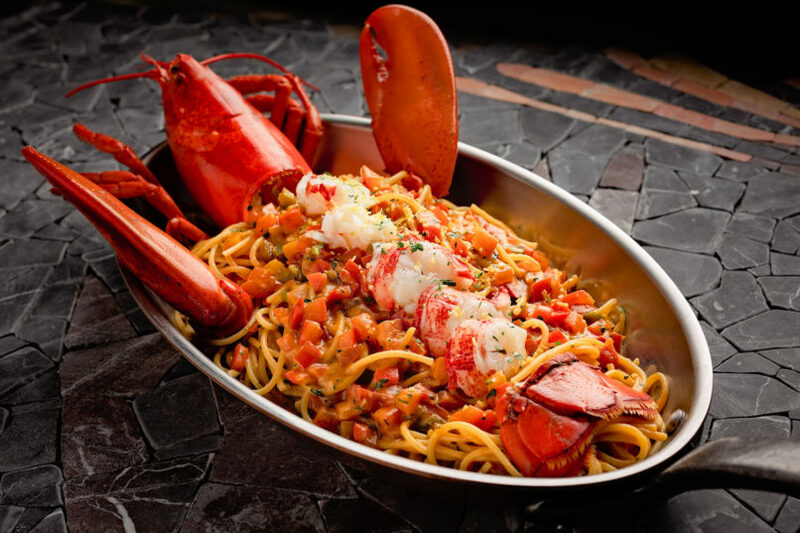 Lobster spaghetti pairs succulent chunks of crustacean with a luscious tomato sauce. The kitchen prides itself on its homemade pastas, and rightly so: On one night we had a lovely seafood bucatini chock full of mussels, calamari and shrimp (HK$278); on the other, a hearty lobster spaghetti was the highlight of the meal, (HK$348 for half lobster), with a vibrant tomato sauce clinging to the toothsome strands, interspersed with succulent chunks of the crustacean. For comparison’s sake, we order one dish off the “From the Land” section, a short list of ribeye, rack of lamb and chicken. The lamb chops (HK$388) bear a nice herb crust, but are less gamey and fatty than we would have liked, with the flavour of the meat falling a little flat despite a zesty pot of chimichurri on the side. It should come as no surprise, however, that the kitchen’s expertise lies with seafood. On both visits, we hailed the calamari as the standout dish: The squid is grilled on the blazing hot grates until imbued with a smoky aroma and a succulent, meaty texture, amplified by a dressing of olive oil, lemon, garlic and herbs. 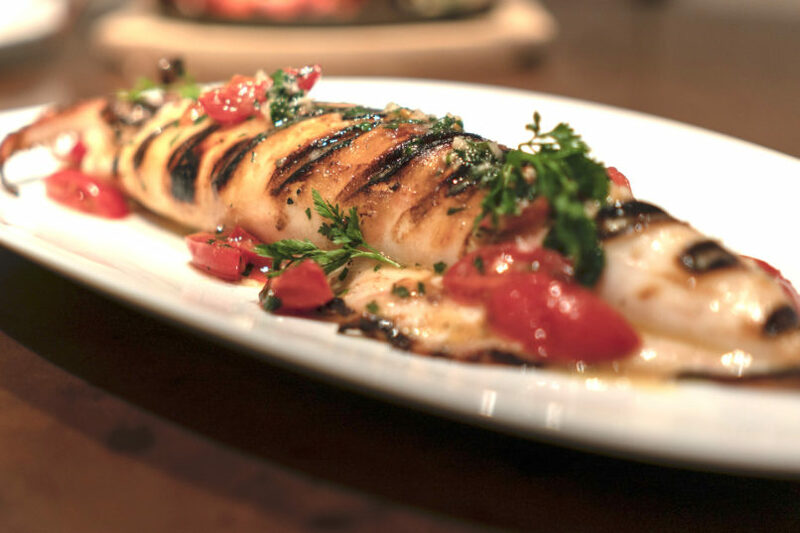 Bearing dark grill marks, the meaty calamari is a highlight of the menu. Prices can vary largely depending on how discerning you are with your menu selections: Stick with the pastas and starters and you can eat well for under HK$600 per person, but the bill easily soars as you dive into the list of the day’s fresh catches, which can range from Greek sea bass to Icelandic langoustines and New Zealand oysters prepared to your liking. Regardless of your budget, make sure you save room for the excellent desserts courtesy of Executive Pastry Chef Marino Kosmas, and a fantastic cocktail list that’s worth a thorough exploration (We particularly love The Cradle of Life (HK$148), with high quality bourbon spiced with sumac and sweetened with fig molasses). Desserts are excellent across the board. 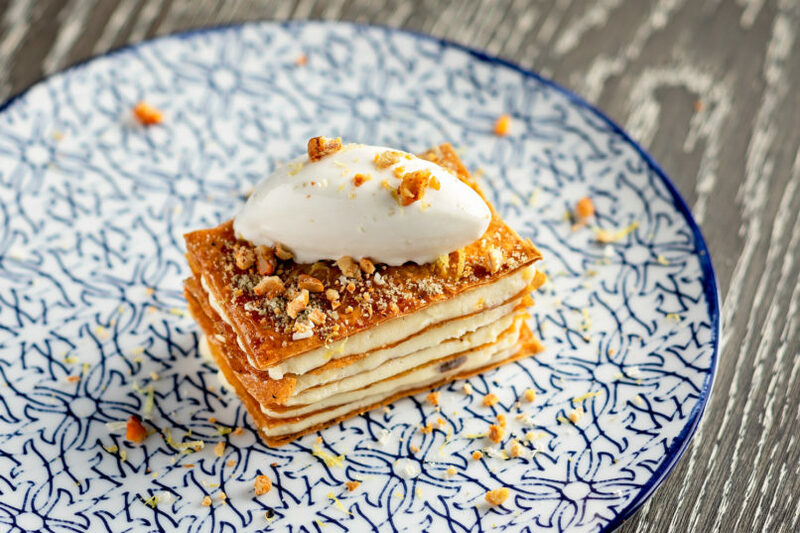 Pictured here: the Lemon Milk Pudding (HK$118) with caramelised filo, pistachios and vanilla ice cream. Working within the parameters of Greek cuisine has given the kitchen a sense of focus at Estiatorio Keia, which comes through in the confident direction of dishes, the stable rhythm of service, and some standout items on the menu. Some of the plates require further fine tuning and service could use an injection of liveliness, but for the most part, Keia delivers on its promise of transporting diners to the Mediterranean with sunny Greek dishes rooted in fresh Aegean produce. At Seafood Room, it was easy to feel as if you were paying a premium for the extravagant décor and the chance to rub shoulders with VIPs; here at Keia, the beautiful atmosphere feels more like the proverbial cherry on top, tacked on to the bones of a solid food and drink offering and a confident kitchen operation. Whether it will pass the 6- or 12-month thresholds comes down to the group’s ability to reign in some of its more superficial tendencies and tap into the idiosyncrasies that make a restaurant feel tethered to the local scene, rather than some lofty transplant. If Keia can prove its longevity, it should be a step towards cementing the group’s ambitious plans to move into major dining capitals such as London and New York in coming years. As for atoning for prior transgressions? Well, one can only hope. Recommended Dishes: Salmon tartare, pita with dips, saganaki, Mykonian salad, lobster spaghetti, seafood bucatini with bottarga, whole sea bass, desserts. Price: Varies with market prices of seafood; from HK$600–$1,000 per person with drinks. Noise Level: Comfortable. Spacious, open layout allows for both private conversations and rowdy group dinners. Service: Well-trained yet somewhat detached.